An introduction to marking up a document. The document's address is an absolute URL that is set when the Document is created. The document's current address is an absolute URL that can change during the lifetime of the Document, for example when the user navigates to a fragment identifier on the page. The document's current address must be set to the document's address when the Document is created. When a Document is created by a script using the createDocument() API, the document's address is the same as the document's address of the active document of the script's browsing context. A Document object created by the createDocument() API on the DOMImplementation object is initially an XML document, but can be made into an HTML document by calling document.open() on it. All Document objects (in user agents implementing this specification) must also implement the HTMLDocument interface, available using binding-specific methods. (This is the case whether or not the document in question is an HTML document or indeed whether it contains any HTML elements at all.) Document objects must also implement the document-level interface of any other namespaces found in the document that the UA supports. For example, if an HTML implementation also supports SVG, then the Document object implements both HTMLDocument and SVGDocument. Because the HTMLDocument interface is now obtained using binding-specific casting methods instead of simply being the primary interface of the document object, it is no longer defined as inheriting from Document. Since the HTMLDocument interface holds methods and attributes related to a number of disparate features, the members of this interface are described in various different sections. User agents must raise a SECURITY_ERR exception whenever any of the members of an HTMLDocument object are accessed by scripts whose effective script origin is not the same as the Document's effective script origin. The URL attribute must return the document's address. The referrer attribute must return either the address of the active document of the source browsing context at the time the navigation was started (that is, the page which navigated the browsing context to the current document), or the empty string if there is no such originating page, or if the UA has been configured not to report referrers in this case, or if the navigation was initiated for a hyperlink with a noreferrer keyword. In the case of HTTP, the referrer DOM attribute will match the Referer (sic) header that was sent when fetching the current page. If the Document has no browsing context an INVALID_STATE_ERR exception will be thrown. If the contents are sandboxed into a unique origin, a SECURITY_ERR exception will be thrown. The cookie attribute represents the cookies of the resource. This specification does not define what makes an HTTP-only cookie, and at the time of publication the editor is not aware of any reference for HTTP-only cookies. They are a feature supported by some Web browsers wherein an "httponly" parameter added to the cookie string causes the cookie to be hidden from script. Returns the date of the last modification to the document, as reported by the server, in the form "MM/DD/YYYY hh:mm:ss". If the last modification date is not known, it is reported as "01/01/1970 00:00:00"
A U+002F SOLIDUS character ('/'). A U+003A COLON character (':'). All the numeric components above, other than the year, must be given as two digits in the range U+0030 DIGIT ZERO to U+0039 DIGIT NINE representing the number in base ten, zero-padded if necessary. The year must be given as four or more digits in the range U+0030 DIGIT ZERO to U+0039 DIGIT NINE representing the number in base ten, zero-padded if necessary. The Document's source file's last modification date and time must be derived from relevant features of the networking protocols used, e.g. from the value of the HTTP Last-Modified header of the document, or from metadata in the file system for local files. If the last modification date and time are not known, the attribute must return the string "01/01/1970 00:00:00". A Document is always set to one of three modes: no quirks mode, the default; quirks mode, used typically for legacy documents; and limited quirks mode, also known as "almost standards" mode. The mode is only ever changed from the default by the HTML parser, based on the presence, absence, or value of the DOCTYPE string. The compatMode DOM attribute must return the literal string "CSS1Compat" unless the document has been set to quirks mode by the HTML parser, in which case it must instead return the literal string "BackCompat". Safari and IE have special parsing rules for <% ... %> (even in standards mode, though clearly this should be quirks-only). Returns the document's character encoding. Can be set, to dynamically change the document's character encoding. New values that are not IANA-registered aliases are ignored. Returns what might be the user agent's default character encoding. The characterSet DOM attribute must, on getting, return the preferred MIME name of the document's character encoding. The defaultCharset DOM attribute must, on getting, return the preferred MIME name of a character encoding, possibly the user's default encoding, or an encoding associated with the user's current geographical location, or any arbitrary encoding name. Returns "loading" while the Document is loading, and "complete" once it has loaded. Each document has a current document readiness. When a Document object is created, it must have its current document readiness set to the string "loading" if the document is associated with an HTML parser or an XML parser, or to the string "complete" otherwise. Various algorithms during page loading affect this value. When the value is set, the user agent must fire a simple event called readystatechange at the Document object. The readyState DOM attribute must, on getting, return the current document readiness. If the root element is an svg element in the "http://www.w3.org/2000/svg" namespace, and the user agent supports SVG, then the getter must return the value that would have been returned by the DOM attribute of the same name on the SVGDocument interface. Otherwise, it must return a concatenation of the data of all the child text nodes of the title element, in tree order, or the empty string if the title element is null. If the root element is an svg element in the "http://www.w3.org/2000/svg" namespace, and the user agent supports SVG, then the setter must defer to the setter for the DOM attribute of the same name on the SVGDocument interface (if it is readonly, then this will raise an exception). Stop the algorithm here. If the title element is null, then a new title element must be created and appended to the head element. The children of the title element (if any) must all be removed. A single Text node whose data is the new value being assigned must be appended to the title element. The title attribute on the HTMLDocument interface should shadow the attribute of the same name on the SVGDocument interface when the user agent supports both HTML and SVG. If the new value is not a body or frameset element, this will throw a HIERARCHY_REQUEST_ERR exception. The body element of a document is the first child of the html element that is either a body element or a frameset element. If there is no such element, it is null. If the body element is null, then when the specification requires that events be fired at "the body element", they must instead be fired at the Document object. If the new value is not a body or frameset element, then raise a HIERARCHY_REQUEST_ERR exception and abort these steps. Otherwise, the the body element is null. Append the new value to the root element. Returns a NodeList of a, applet, button, form, frame, frameset, iframe, img, input, map, meta, object, select, and textarea elements in the Document that have a name attribute with the value name. Returns a NodeList of the elements in the object on which the method was invoked (a Document or an Element) that have all the classes given by classes. The classes argument is interpreted as a space-separated list of classes. The getElementsByName(name) method takes a string name, and must return a live NodeList containing all the a, applet, button, form, frame, frameset, iframe, img, input, map, meta, object, select, and textarea elements in that document that have a name attribute whose value is equal to the name argument (in a case-sensitive manner), in tree order. The getElementsByClassName(classNames) method takes a string that contains an unordered set of unique space-separated tokens representing classes. When called, the method must return a live NodeList object containing all the elements in the document, in tree order, that have all the classes specified in that argument, having obtained the classes by splitting a string on spaces. If there are no tokens specified in the argument, then the method must return an empty NodeList. If the document is in quirks mode, then the comparisons for the classes must be done in an ASCII case-insensitive manner, otherwise, the comparisons must be done in a case-sensitive manner. The getElementsByClassName(classNames) method on the HTMLElement interface must return a live NodeList with the nodes that the HTMLDocument getElementsByClassName() method would return when passed the same argument(s), excluding any elements that are not descendants of the HTMLElement object on which the method was invoked. HTML, SVG, and MathML elements define which classes they are in by having an attribute in the per-element partition with the name class containing a space-separated list of classes to which the element belongs. Other specifications may also allow elements in their namespaces to be labeled as being in specific classes. A call to document.getElementById('example').getElementsByClassName('aaa') would return a NodeList with the two paragraphs p1 and p2 in it. A call to getElementsByClassName('ccc bbb') would only return one node, however, namely p3. A call to document.getElementById('example').getElementsByClassName('bbb ccc ') would return the same thing. A call to getElementsByClassName('aaa,bbb') would return no nodes; none of the elements above are in the "aaa,bbb" class. The HTMLDocument interface supports named properties. The names of the supported named properties at any moment consist of the values of the name content attributes of all the applet, embed, form, iframe, img, and fallback-free object elements in the Document that have name content attributes, and the values of the id content attributes of all the applet and fallback-free object elements in the Document that have id content attributes, and the values of the id content attributes of all the img elements in the Document that have both name content attributes and id content attributes. An object element is said to be fallback-free if it has no element descendants other than param elements, and no text node descendants that are not inter-element whitespace. The dir attribute on the HTMLDocument interface is defined along with the dir content attribute. Authors must not use elements, attributes, and attribute values for purposes other than their appropriate intended semantic purpose. The attributes marked with an asterisk cannot be specified on body elements as those elements expose event handler attributes of the Window object with the same names. Also, custom data attributes (e.g. data-foldername or data-msgid) can be specified on any HTML element, to store custom data specific to the page. The id attribute represents its element's unique identifier. The value must be unique in the element's home subtree and must contain at least one character. The value must not contain any space characters. If the value is not the empty string, user agents must associate the element with the given value (exactly, including any space characters) for the purposes of ID matching within the element's home subtree (e.g. for selectors in CSS or for the getElementById() method in the DOM). This specification doesn't preclude an element having multiple IDs, if other mechanisms (e.g. DOM Core methods) can set an element's ID in a way that doesn't conflict with the id attribute. The id DOM attribute must reflect the id content attribute. The title attribute represents advisory information for the element, such as would be appropriate for a tooltip. On a link, this could be the title or a description of the target resource; on an image, it could be the image credit or a description of the image; on a paragraph, it could be a footnote or commentary on the text; on a citation, it could be further information about the source; and so forth. The value is text. If the title attribute's value contains U+000A LINE FEED (LF) characters, the content is split into multiple lines. Each U+000A LINE FEED (LF) character represents a line break. The title DOM attribute must reflect the title content attribute. If these attributes are omitted from an element, then the language of this element is the same as the language of its parent element, if any. Setting the attribute to the empty string indicates that the primary language is unknown. The lang attribute may be used on any HTML element. The xml:lang attribute may be used on HTML elements in XML documents, as well as elements in other namespaces if the relevant specifications allow it (in particular, MathML and SVG allow xml:lang attributes to be specified on their elements). If both the lang attribute and the xml:lang attribute are specified on the same element, they must have exactly the same value when compared in an ASCII case-insensitive manner. Authors must not use the xml:lang attribute (that is, the lang attribute with the xml prefix in the http://www.w3.org/XML/1998/namespace namespace) in HTML documents. To ease migration to and from XHTML, authors may specify an attribute in no namespace with no prefix and with the localname xml:lang on HTML elements in HTML documents, but such attributes must only be specified if a lang attribute is also specified, and both attributes must have the same value when compared in an ASCII case-insensitive manner. To determine the language of a node, user agents must look at the nearest ancestor element (including the element itself if the node is an element) that has an xml:lang attribute set or is an HTML element and has a lang attribute set. That attribute specifies the language of the node. If both the xml:lang attribute and the lang attribute are set on an element, user agents must use the xml:lang attribute, and the lang attribute must be ignored for the purposes of determining the element's language. If no explicit language is given for the root element, but there is a document-wide default language set, then that is the language of the node. If there is no document-wide default language, then language information from a higher-level protocol (such as HTTP), if any, must be used as the final fallback language. In the absence of any language information, the default value is unknown (the empty string). If the resulting value is not a recognized language code, then it must be treated as an unknown language (as if the value was the empty string). User agents may use the element's language to determine proper processing or rendering (e.g. in the selection of appropriate fonts or pronunciations, or for dictionary selection). The lang DOM attribute must reflect the lang content attribute. The xml:base attribute may be used on elements of XML documents. Authors must not use the xml:base attribute in HTML documents. The dir attribute specifies the element's text directionality. The attribute is an enumerated attribute with the keyword ltr mapping to the state ltr, and the keyword rtl mapping to the state rtl. The attribute has no defaults. The processing of this attribute is primarily performed by the presentation layer. For example, the rendering section in this specification defines a mapping from this attribute to the CSS 'direction' and 'unicode-bidi' properties, and CSS defines rendering in terms of those properties. The directionality of an element, which is used in particular by the canvas element's text rendering API, is either 'ltr' or 'rtl'. If the user agent supports CSS and the 'direction' property on this element has a computed value of either 'ltr' or 'rtl', then that is the directionality of the element. Otherwise, if the element is being rendered, then the directionality of the element is the directionality used by the presentation layer, potentially determined from the value of the dir attribute on the element. Otherwise, if the element's dir attribute has the state ltr, the element's directionality is 'ltr' (left-to-right); if the attribute has the state rtl, the element's directionality is 'rtl' (right-to-left); and otherwise, the element's directionality is the same as its parent element, or 'ltr' if there is no parent element. Can be set, to either "ltr" or "rtl", to replace the html element's dir attribute's value. The dir DOM attribute on an element must reflect the dir content attribute of that element, limited to only known values. The dir DOM attribute on HTMLDocument objects must reflect the dir content attribute of the html element, if any, limited to only known values. If there is no such element, then the attribute must return the empty string and do nothing on setting. The attribute, if specified, must have a value that is an unordered set of unique space-separated tokens representing the various classes that the element belongs to. The classes that an HTML element has assigned to it consists of all the classes returned when the value of the class attribute is split on spaces. Authors may use any value in the class attribute, but are encouraged to use the values that describe the nature of the content, rather than values that describe the desired presentation of the content. The className and classList DOM attributes must both reflect the class content attribute. In user agents that support CSS, the attribute's value must be parsed when the attribute is added or has its value changed, with its value treated as the body (the part inside the curly brackets) of a declaration block in a rule whose selector matches just the element on which the attribute is set. All URLs in the value must be resolved relative to the element when the attribute is parsed. For the purposes of the CSS cascade, the attribute must be considered to be a 'style' attribute at the author level. A custom data attribute is an attribute whose name starts with the string "data-", has at least one character after the hyphen, is XML-compatible, has no namespace, and contains no characters in the range U+0041 .. U+005A (LATIN CAPITAL LETTER A .. LATIN CAPITAL LETTER Z). All attributes in HTML documents get lowercased automatically, so the restriction on uppercase letters doesn't affect such documents. For each content attribute on the element whose first five characters are the string "data-", add a name-value pair to list whose name is the attribute's name with the first five character removed and whose value is the attribute's value. Let name be the concatenation of the string data- and the name passed to the algorithm. Set the value of the attribute with the name name, to the value value, replacing any previous value if the attribute already existed. If setAttribute() would have raised an exception when setting an attribute with the name name, then this must raise the same exception. All the elements in this specification have a defined content model, which describes what nodes are allowed inside the elements, and thus what the structure of an HTML document or fragment must look like. As noted in the conformance and terminology sections, for the purposes of determining if an element matches its content model or not, CDATASection nodes in the DOM are treated as equivalent to Text nodes, and entity reference nodes are treated as if they were expanded in place. Inter-element whitespace, comment nodes, and processing instruction nodes must be ignored when establishing whether an element matches its content model or not, and must be ignored when following algorithms that define document and element semantics. An element A is said to be preceded or followed by a second element B if A and B have the same parent node and there are no other element nodes or text nodes (other than inter-element whitespace) between them. Authors must not use elements in the HTML namespace anywhere except where they are explicitly allowed, as defined for each element, or as explicitly required by other specifications. For XML compound documents, these contexts could be inside elements from other namespaces, if those elements are defined as providing the relevant contexts. In addition, elements in the HTML namespace may be orphan nodes (i.e. without a parent node). In addition, certain elements are categorized as form-associated elements and further subcategorized to define their role in various form-related processing models. Some elements have unique requirements and do not fit into any particular category. As a general rule, elements whose content model allows any flow content should have either at least one descendant text node that is not inter-element whitespace, or at least one descendant element node that is embedded content. For the purposes of this requirement, del elements and their descendants must not be counted as contributing to the ancestors of the del element. Sectioning content is content that defines the scope of headers, footers, and contact information. Text nodes that are not inter-element whitespace are phrasing content. Certain elements in HTML have an activation behavior, which means that the user can activate them. This triggers a sequence of events dependent on the activation mechanism, and normally culminating in a click event followed by a DOMActivate event, as described below. When a user agent is to run synthetic click activation steps on an element, the user agent must run pre-click activation steps on the element, then fire a click event at the element. The default action of this click event must be to run post-click activation steps on the element. If the event is canceled, the user agent must run canceled activation steps on the element instead. Let e be the nearest activatable element of the element designated by the user, if any. Dispatching the required click event. Another specification presumably requires the firing of the click event? If there is an element e, then the default action of the click event must be to run post-click activation steps on element e.
If there is an element e but the event is canceled, the user agent must run canceled activation steps on element e.
When a user agent is to run post-click activation steps on an element, the user agent must fire a simple event called DOMActivate at that element. The default action of this event must be to run final activation steps on that element. If the event is canceled, the user agent must run canceled activation steps on the element instead. When a user agent is to run final activation steps on an element, it must run the activation behavior defined for that element. Activation behaviors can refer to the click and DOMActivate events that were fired by the steps above leading up to this point. Some elements are described as transparent; they have "transparent" in the description of their content model. When a content model includes a part that is "transparent", those parts must not contain content that would not be conformant if all transparent elements in the tree were replaced, in their parent element, by the children in the "transparent" part of their content model, retaining order. A paragraph is typically a block of text with one or more sentences that discuss a particular topic, as in typography, but can also be used for more general thematic grouping. For instance, an address is also a paragraph, as is a part of a form, a byline, or a stanza in a poem. 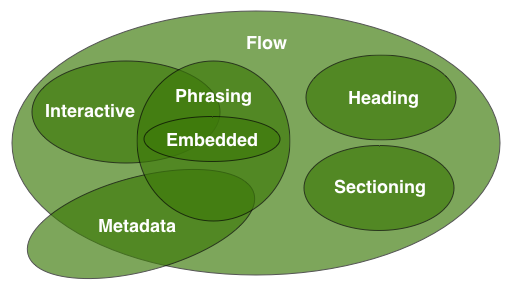 Paragraphs in flow content are defined relative to what the document looks like without the a, ins and del elements complicating matters, since those elements, with their hybrid content models, can straddle paragraph boundaries. Conformance checkers may warn authors of cases where they have paragraphs that overlap each other. In the following example, there are two paragraphs in a section. There is also a header, which contains phrasing content that is not a paragraph. Note how the comments and inter-element whitespace do not form paragraphs. The following example takes that markup and puts ins and del elements around some of the markup to show that the text was changed (though in this case, the changes admittedly don't make much sense). Notice how this example has exactly the same paragraphs as the previous one, despite the ins and del elements. In the following example, the link spans half of the first paragraph, all of the header separating the two paragraphs, and half of the second paragraph. For HTML documents, and for HTML elements in HTML documents, certain APIs defined in DOM3 Core become case-insensitive or case-changing, as sometimes defined in DOM3 Core, and as summarized or required below. [DOM3CORE]. This does not apply to XML documents or to elements that are not in the HTML namespace despite being in HTML documents. These attributes must return element names converted to uppercase, regardless of the case with which they were created. The canonical form of HTML markup is all-lowercase; thus, this method will lowercase the argument before creating the requisite element. Also, the element created must be in the HTML namespace. This doesn't apply to Document.createElementNS(). Thus, it is possible, by passing this last method a tag name in the wrong case, to create an element that claims to have the tag name of an element defined in this specification, but doesn't support its interfaces, because it really has another tag name not accessible from the DOM APIs. Attribute names are converted to lowercase. Specifically: when an attribute is set on an HTML element using Element.setAttribute(), the name argument must be converted to lowercase before the element is affected; and when an Attr node is set on an HTML element using Element.setAttributeNode(), it must have its name converted to lowercase before the element is affected. This doesn't apply to Document.setAttributeNS() and Document.setAttributeNodeNS(). These methods (but not their namespaced counterparts) must compare the given argument in an ASCII case-insensitive manner when looking at HTML elements, and in a case-sensitive manner otherwise. Thus, in an HTML document with nodes in multiple namespaces, these methods will be both case-sensitive and case-insensitive at the same time. APIs for dynamically inserting markup into the document interact with the parser, and thus their behavior, varies depending on whether they are used with HTML documents (and the HTML parser) or XHTML in XML documents (and the XML parser). If the replace argument is absent or false, a new entry is added to the session history to represent this entry, and the previous entries for this Document are all collapsed into one entry with a new Document object. Unload the Document object, with the recycle parameter set to true. If the user refused to allow the document to be unloaded, then these steps must be aborted. If the document has an active parser, then stop that parser, and throw away any pending content in the input stream. what about if it doesn't, because it's either like a text/plain, or Atom, or PDF, or XHTML, or image document, or something? Change the document's character encoding to UTF-16. Change the document's address to the first script's browsing context's active document's address. Mark the document as being an HTML document (it might already be so-marked). If the type string contains a U+003B SEMICOLON (;) character, remove the first such character and all characters from it up to the end of the string. Strip all leading and trailing space characters from type. If type is not now an ASCII case-insensitive match for the string "text/html", then act as if the tokenizer had emitted a start tag token with the tag name "pre", then set the HTML parser's tokenization stage's content model flag to PLAINTEXT. When called with three or more arguments, the open() method on the HTMLDocument object must call the open() method on the Window object of the HTMLDocument object, with the same arguments as the original call to the open() method, and return whatever that method returned. If the HTMLDocument object has no Window object, then the method must raise an INVALID_ACCESS_ERR exception. The close() method must do nothing if there is no script-created parser associated with the document. If there is such a parser, then, when the method is called, the user agent must insert an explicit "EOF" character at the end of the parser's input stream. Adds the given string(s) to the Document's input stream. If necessary, calls the open() method implicitly first. This method throws an INVALID_ACCESS_ERR exception when invoked on XML documents. If the method was invoked on an XML document, throw an INVALID_ACCESS_ERR exception and abort these steps. If the insertion point is undefined, the open() method must be called (with no arguments) on the document object. If the user refused to allow the document to be unloaded, then these steps must be aborted. Otherwise, the insertion point will point at just before the end of the (empty) input stream. The string consisting of the concatenation of all the arguments to the method must be inserted into the input stream just before the insertion point. If there is a pending external script, then the method must now return without further processing of the input stream. Otherwise, the tokenizer must process the characters that were inserted, one at a time, processing resulting tokens as they are emitted, and stopping when the tokenizer reaches the insertion point or when the processing of the tokenizer is aborted by the tree construction stage (this can happen if a script end tag token is emitted by the tokenizer). Finally, the method must return. The innerHTML DOM attribute represents the markup of the node's contents. Returns a fragment of HTML or XML that represents the Document. Can be set, to replace the Document's contents with the result of parsing the given string. In the case of XML documents, will throw a SYNTAX_ERR if the Document cannot be serialized to XML, or if the given string is not well-formed. In the case of XML documents, will throw a SYNTAX_ERR if the element cannot be serialized to XML, or if the given string is not well-formed. On getting, if the node's document is an HTML document, then the attribute must return the result of running the HTML fragment serialization algorithm on the node; otherwise, the node's document is an XML document, and the attribute must return the result of running the XML fragment serialization algorithm on the node instead (this might raise an exception instead of returning a string). If the node's document is an HTML document: Invoke the HTML fragment parsing algorithm. If the node's document is an XML document: Invoke the XML fragment parsing algorithm. In either case, the algorithm must be invoked with the string being assigned into the innerHTML attribute as the input. If the node is an Element node, then, in addition, that element must be passed as the context element. If this raises an exception, then abort these steps. Otherwise, let new children be the nodes returned. If the attribute is being set on a Document node, and that document has an active HTML parser or XML parser, then stop that parser. what about if it doesn't, because it's either like a text/plain, or Atom, or PDF, or XHTML, or image document, or something? Remove the child nodes of the node whose innerHTML attribute is being set, firing appropriate mutation events. If the attribute is being set on a Document node, let target document be that Document node. Otherwise, the attribute is being set on an Element node; let target document be the ownerDocument of that Element. Set the ownerDocument of all the nodes in new children to the target document. Append all the new children nodes to the node whose innerHTML attribute is being set, preserving their order, and firing mutation events as appropriate. The outerHTML DOM attribute represents the markup of the element and its contents. On getting, if the node's document is an HTML document, then the attribute must return the result of running the HTML fragment serialization algorithm on a fictional node whose only child is the node on which the attribute was invoked; otherwise, the node's document is an XML document, and the attribute must return the result of running the XML fragment serialization algorithm on that fictional node instead (this might raise an exception instead of returning a string). Let target be the element whose outerHTML attribute is being set. If target has no parent node, then abort these steps. There would be no way to obtain a reference to the nodes created even if the remaining steps were run. If target's parent node is a Document object, throw a NO_MODIFICATION_ALLOWED_ERR exception and abort these steps. Let parent be target's parent node, unless that is a DocumentFragment node, in which case let parent be an arbitrary body element. If target's document is an HTML document: Invoke the HTML fragment parsing algorithm. If target's document is an XML document: Invoke the XML fragment parsing algorithm. In either case, the algorithm must be invoked with the string being assigned into the outerHTML attribute as the input, and parent as the context element. Otherwise, let new children be targets returned. Set the ownerDocument of all the nodes in new children to target's document. Remove target from its parent node, firing mutation events as appropriate, and then insert in its place all the new children nodes, preserving their order, and again firing mutation events as appropriate. Throws a SYNTAX_ERR exception the arguments have invalid values (e.g., in the case of XML documents, if the given string is not well-formed). Throws a NO_MODIFICATION_ALLOWED_ERR exception if the given position isn't possible (e.g. inserting elements after the root element of a Document). Let position and text be the method's first and second arguments, respectively. Let target be the element on which the method was invoked. If target has no parent node, then abort these steps. If target's parent node is a Document object, then throw a NO_MODIFICATION_ALLOWED_ERR exception and abort these steps. Otherwise, let context be the parent node of target. Let context be the same as target. In either case, the algorithm must be invoked with text as the input, and the element selected in by the previous step as the context element. Insert all the new children nodes immediately before target. Insert all the new children nodes before the first child of target, if there is one. If there is no such child, append them all to target. Append all the new children nodes to target. Insert all the new children nodes immediately after target. The new children nodes must be inserted in a manner that preserves their order and fires mutation events as appropriate.